On 27 August 2003, the planet Mars was at its closest to Earth in over 60,000 years. This event coincided with the 2003 National Astronomy Week and so the Stratford upon Avon Astronomical Society decided to celebrate this week with an open evening all about Mars. The meeting consisted of a lecture by Jerry Workman. After this, we had planned to hold a Star Party, where members of the public could view the red planet. Jerry Workman's talk was based on the discoveries that the Mars missions have made during their time on the surface of the planet and orbiting it. The theory that there is water on Mars was once dismissed. Recently however, this view has been challenged. A lot of evidence of water erosion is clearly displayed on the Martian surface. This water does not sit on the surface, as the atmospheric pressure is too low to retain water and it is very likely in the form of permafrost below the Martian surface. We were shown close up pictures of where water flowed, creating tributaries. If you stood on Mars, the surface would look and feel like chalk dust. This dust is blown around by the wind and due to the low gravity, huge dust storms covering the whole planet can form. These dust storms occur more frequently when the planet nears the Sun. Therefore, observation of Mars can be hampered by the weather on the planet itself in addition to that on Earth. After the talk, it was hoped that the clouds (on Earth) would have cleared, giving everyone a chance to see the planet. Unfortunately, the weather didn't co-operate. The recent excitement about Mars concerns the morning of 27 August 2003, when Mars and the Earth were at their closest for 60,000 years. They passed at a distance of 55,760,000 km. So why does this happen? The Earth is closer to the Sun than Mars and takes a shorter time to go around the Sun, 365 days compared with the 687 days of Mars. Every twenty six months, we overtake Mars on the inside track. This is known as opposition. The planets' orbits are elliptical, and so their proximity to the Sun varies. At this particular opposition, Mars was nearing is closest to the Sun, whilst the Earth was nearing its furthest. Therefore the distance from the Earth to Mars was minimised. This doesn't happen very often but has happened in: 1845, 1877, 1892, 1924, 1956, and 1971. In the future it will happen on 27 July 2018 and 15 September 2035. Even though this event has gone, it is still possible to see Mars as we leave it behind. On good nights throughout September, it will still be the brightest object in the southern sky and it rises earlier each night. You can see the South Polar Cap quite easily in a small telescope. With larger amateur telescopes you can see more detail of the red planet's surface. The reason it is red is because of iron(III) oxide – in other words, rust – on the surface. 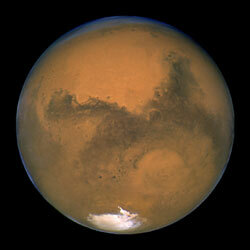 For more information about the planet Mars, check out NASA's Mars Exploration page.